Eighteen protesters were arrested Tuesday morning during a demonstration outside the headquarters of the National Rifle Association (NRA) in Fairfax County, Virginia. Protesters laid on the ground inside chalk outlines during a "die-in," with palms painted red to symbolize the blood of those killed by gun violence. The protesters had spent the night outside the NRA, some with lawn chairs or sleeping bags, in advance of planned civil disobedience Tuesday morning. They chanted "Arrest the NRA" as they marched in support of tougher background checks and the banning of assault weapons. "It could have happened to any of us; it has happened to many of us and if the NRA has its way, it will happen again," said one protester. They were prepared to be arrested, authorities said. Protesters were given guidelines and a five-minute warning before the arrests, said Fairfax County Police. Those arrested were taken to a police cruiser and were issued summonses and charged with loitering on a highway, a class 4 misdemeanor, police said about 9:40 a.m. Tuesday. They were then released. Protesters have staged monthly demonstrations outside the NRA headquarters since the Sandy Hook Elementary School massacre in December 2012. 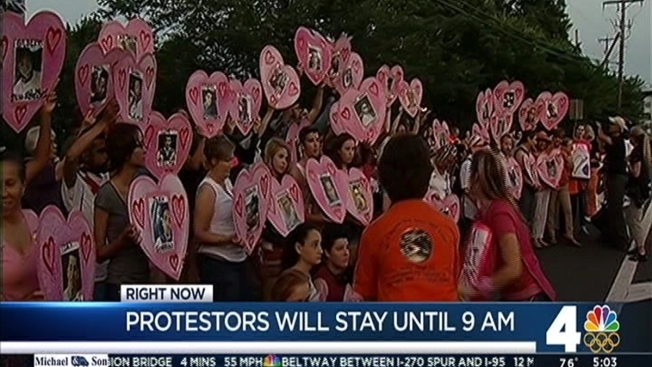 Now the group Code Pink has joined them to step up protests in the wake of the recent Orlando nightclub shooting, calling Monday's protest a vigil, a "lock-in" and a "die-in" on Twitter. Code Pink interns were arrested for blocking the front entrance of the NRA, the group tweeted Tuesday morning. Monday night, the group read the names of the Orlando victims starting at 2:02 a.m., the same time the massacre inside the nightclub began, the group said on Twitter. They also held up pink hearts with names and photos of the victims, later stringing the hearts on trees outside the NRA Tuesday morning. Counter-protesters also showed up at one point, saying they should blame the shooter and not the weapon. A group of pro-NRA demonstrators said they didn't go to discuss policy or law, and that they, too, mourn the Orlando victims. "It was a hater that came and took their lives and destroyed those families... for the rest of their lives," said one. The NRA issued a statement saying it respects the entire Constitution, including the First Amendment, "unlike these anti-Second Amendment groups that like to pick and choose which amendments are valid...."
"Well, people have a right to protect themselves and defend themselves; we were just talking about that," said protester Kim Harrison early Monday. "But at the same token, you've got assault rifles in the hands of people who are just going around, just killing folks. That's not fair, [to] just have people taking out their lives like that." At Blue Ridge Arsenal in Chantilly, Virginia, sales of automatic weapons and handguns have gone up in the week and a half since the shooting in Orlando. "There is not one person in this store who doesn't want the gun violence to stop," said Katie Myers, director of training at the store. "There's not one person at the NRA who doesn't want the gun violence to stop. But I think we need to focus on the actual person behind the violence, bot the firearm itself."